A framed paper honour roll commemorates those who served and those who died in World War One. It lists 257 names. The monthly meeting of the Kingborough Municipal Council was held yesterday. The Warden expressed delight of the municipality at the cessation of hostilities. He moved,- "that this council records its deep thankfulness at the cessation of hostilities, and expressed the wish that a lasting peace may result". Councillor Charlton seconded the motion, and it was carried amidst cheers. The first verse of the National Anthem was sung. Five residents of Kettering requested permission to erect a soldiers' memorial at the corner of the roads leading to Woodbridge and Kettering. Councillor Charlton thought this example should be followed by every municipality in the State. 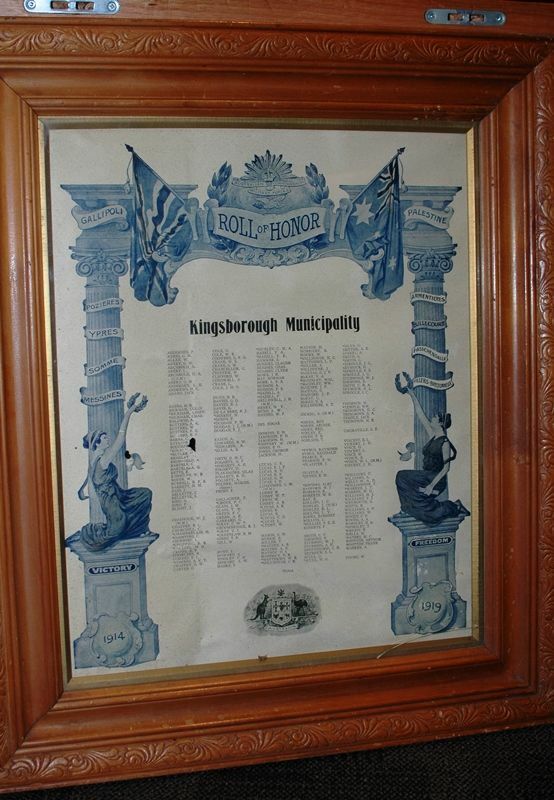 Now that the war was over Kingborough should prepare an honour board, containing the names of men from the district who had enlisted. It should be hung in the council chambers. The Warden said the choosing of a design for an honour roll was receiving his attention. It would be accelerated, and designs would be submitted to the next meeting of the council. The Mercury (Hobart), 11th December 1918.